Bloo 'n' Stuff: Back To School Shopping! What's this? An entry two days in a row? Wonders never cease! I was originally going to write yesterday's entry a little earlier in the week, and make it a 'what I did at the weekend' post. Then I was going to write about my latest hospital visit yesterday. However, me being me.. I ended up procrastinating. Well I wasn't just being lazy. I actually had quite a good reason. My tension headaches have reared their ugly heads again. Either way, I ended up writing about my foray back into the world of Ice Hockey (watching, not playing obvs) yesterday and I rambled on so much I figured I'd have to leave my Sunday adventures until today. So here I am. 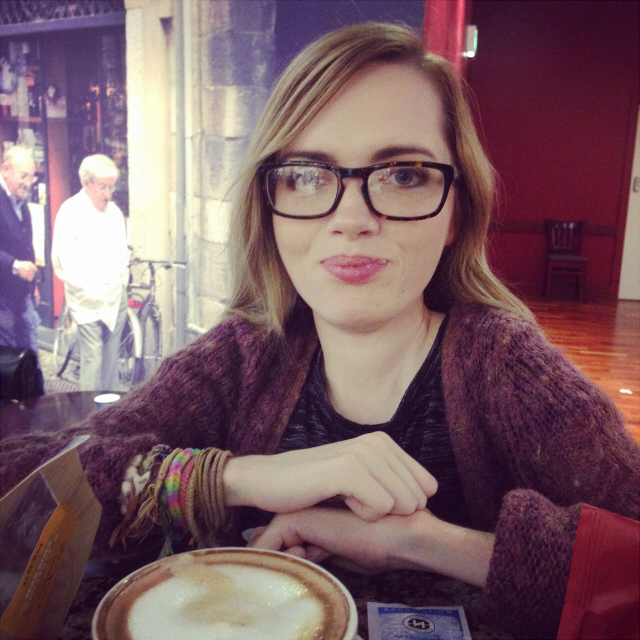 My sister and I planned all week last week to go to Belfast on Sunday (31/08/14). She started back to class on Tuesday and had to get her stationary supplies, etc. before that. Even though I wasn't sure if I had been accepted on to the course I applied for yet, I figured I could pick up a few supplies too. Anyone that really knows me, knows how much I love school supplies. The sting of going back to school at the end of the summer was always softened by the annual stationary supply shopping! I remember my parents giving me a few pounds as a kid to go into town with my friends to buy what I needed. They always really underestimated how much that stuff cost. Ah, nostalgia. Luckily I wasn't too tired from being out the night before. I've been trying to build up my tolerance for getting out of the house. It sounds silly, but I think I've gotten too used to doing nothing. I get drained so easily and that's when the headaches start. I want to be able to leave the house more than once a week and not get totally wiped out. 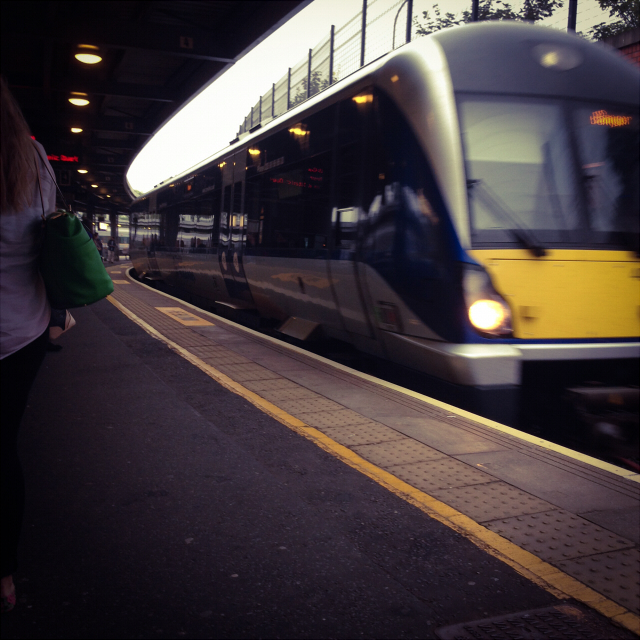 Eva and I got dressed and made our way up on the train to Belfast. Eva wanted to get some clothes too, so we planned to hit Primark and H&M as well as Paperchase. Nowhere does prettier stationary than Paperchase. Problem is some of it is too pretty. I don't know how many notebooks I've bought that haven't got so much as a word or doodle in them. Still, it's a must. 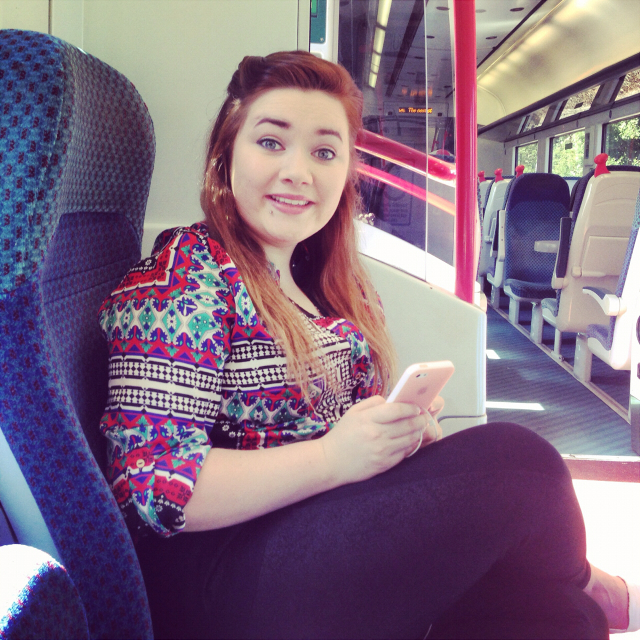 Beautiful Miss Eva Paige on the train. We went to Primark first and I have to say, I have a love/hate relationship with that shop. I love that you can find some nice bargains, but I hate that the shop is always so cramped. There's so much stuff and it's always highly disorganised. I dislike clothes shops at the best of times, but it really takes the biscuit. Don't get me wrong, I love fashion. I love finding cool clothes and I love buying new clothes, but I hate clothes shopping. As a tiny/out of proportion human being, I find it extremely hard to find clothes that would go in the middle part of a venn diagram for 'clothes I like' and 'clothes that fit'. Thank you Muscular Dystrophy. Anyway! Enough complaining. I actually did pick up a t-shirt I really like. I wear t-shirts a lot. 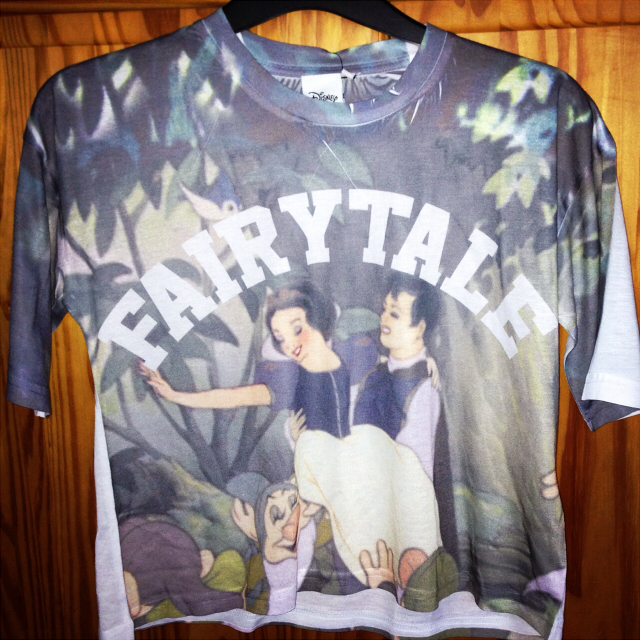 Most of the ones I have are actually for boys (thank you River Island kids). I find a lot of women's t-shirts in shops have really wide or low necklines and I don't fancy flashing people my 0 cup breasts. But on Sunday I think I struck gold. So did Eva, as she also bought the same t-shirt. 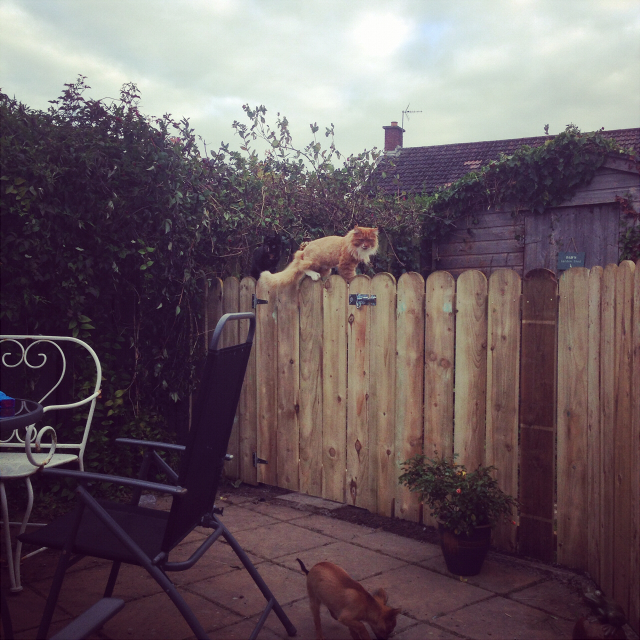 My cats on said fence the day it was built. My tortie cat Effy is pretty well camoflaged. The ginger boy is Findlay. Luckily I didn't see anything I liked anyway. 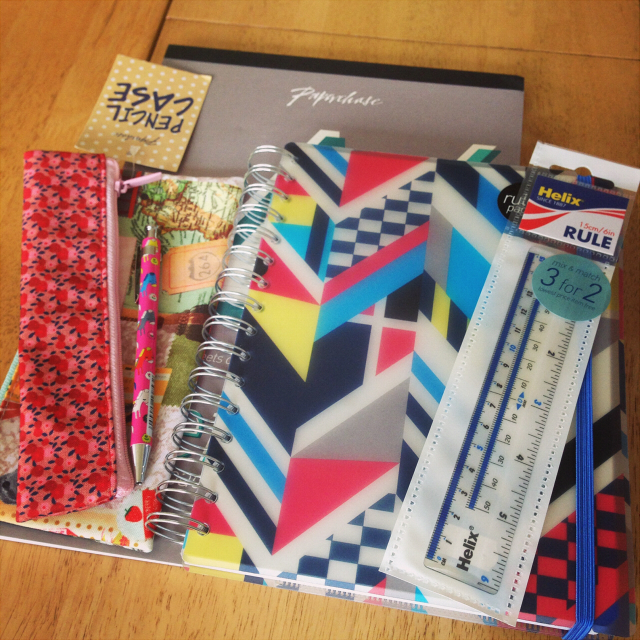 I also did very well and didn't over indulge myself at Paperchase either. I basically got the essentials. Okay, I could have possibly skipped buying a notebook. I have many lying around the house, but I couldn't resist! Here is a photo of what I bought, minus a eraser I left out by accident. All in all, I did pretty well. I just need to pick up a file and some clear plastic pockets. I got a letter today to say I got into class, so my money wasn't wasted. I'll have to go on Monday to pay and take my proof of disability letter to Learning Support. My class starts on Thursday. I'm still pretty nervous, but I'm just trying not to let that get the better of me. I mean there's kids going off to University and leaving home for the first time! I can survive one subject, one night a week. Anyway, back to Sunday! 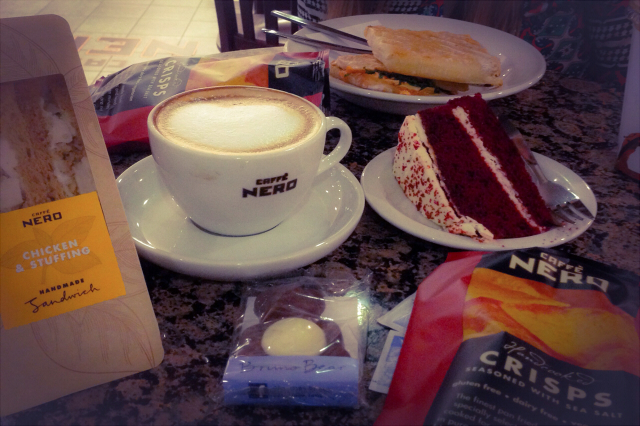 After that we went for a bite to eat in Caffé Nero. I got my usual chicken and stuffing sandwiches that make me nostalgic for my old tech days, a latte, a chocolate bear, a packet of crisps and a piece of Caffé Nero's red velvet cake. No joke, that cake is to die for. I would literally marry it and have little red velvet babies with it. Sorry, that's a bit much. After our grub we headed back to the train. We JUST missed a train home and had to wait an our for the next one. All was not lost though as that give me the opportunity to find and purchase this little beauty! 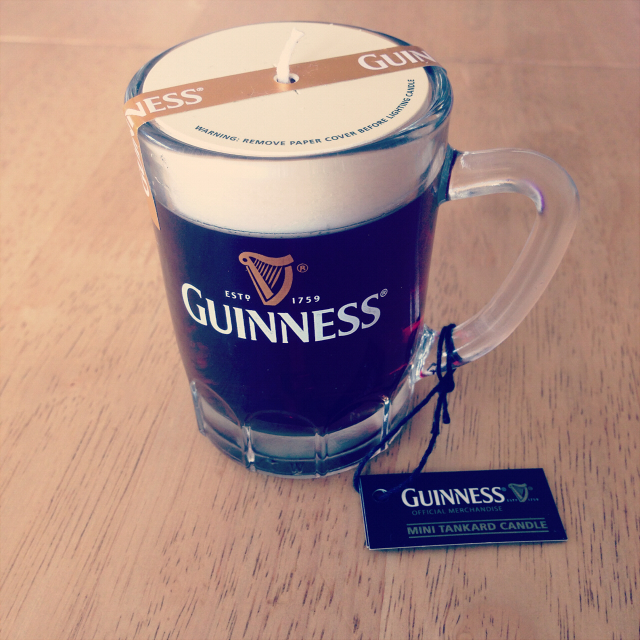 Who doesn't want a miniature pint of Guinness candle! I was a little disappointed it smells like vanilla rather than actual Guiness, but still. It's hella cute! Eventually the train came and we were off on our way home. Considering we left for Belfast pretty late and didn't really go to too many shops the day felt kinda long. Still, it was a great day. And I was proud of myself that I didn't spend too much. Sometimes once I start spending, the flood gates kind of open up. Maybe I'm getting good at this responsible adult thing! 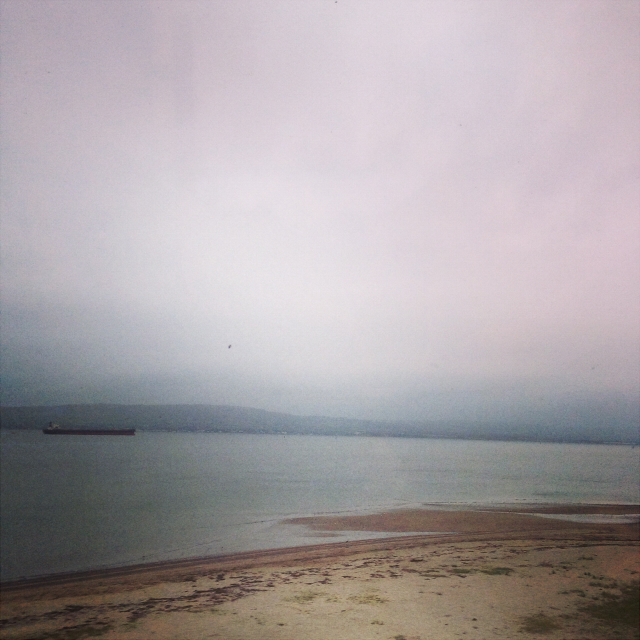 The train arriving and some lovely gloomy Northern Irish scenery on the way home. Okay guys. Once again I have rambled on, so I'm not going to include my respiratory check up in this entry! I guess that will have to wait until tomorrow. Maybe some of my fellow bloggers could give me some feedback. Should I make my posts more short and to the point and cover more topics in a single post? Or is splitting topics up better for the flow of the blog etc? 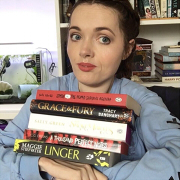 I am wary of rambling on and becoming boring, but I also want my readers to get to know me and I also don't want to feel like I'm stifling the natural flow of writing what comes to me. Though that is a less preferable way obviously. Lol. Thank you! Yes, its definitely the best stationary/art supply shop. Everything is so pretty.